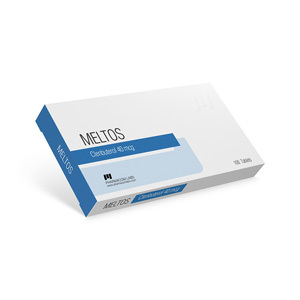 Meltos 40 – a drug that is used for drying the body, can be used alone or with other fat burning preparations. Men should take 120-140 mcg (maximum dosage) to start with 40 mcg and gradually increase the dosage, usually 100 tabs are ordered per course. The duration of the course is not more than 4 weeks. Women should start the course with 20 mcg and gradually reach 80-100 mcg (maximum dosage), it will be enough to order 100 tabs for the course, the course duration is 2-4 weeks. Accepted in the morning, on an empty stomach, before meals, after 20 minutes you can eat. Absolutely with all anabolic steroids, such as: testosterone, boldenone, deck, and so on, as well as fat burning drugs, such as thyroxine. After clenbuterol, it is not necessary to do PCT, just take a break from taking weeks 4-6.